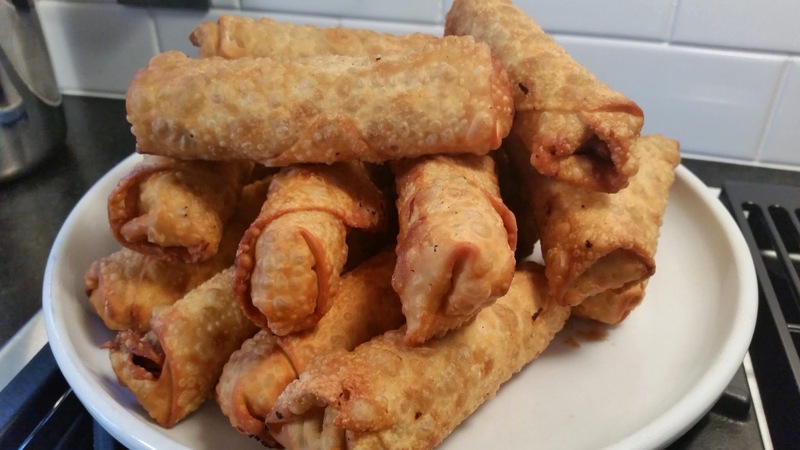 So when there’s leftover char siu from the night before, you dice it up and make egg rolls! I had about 1/2 a pound remaining so I used a bag of coleslaw mix (I was being lazy), some carrots, and sliced green onions. In a non-stick skillet (or wok) over medium heat, add a tablespoon of oil. When it’s good and hot, add the cabbage. 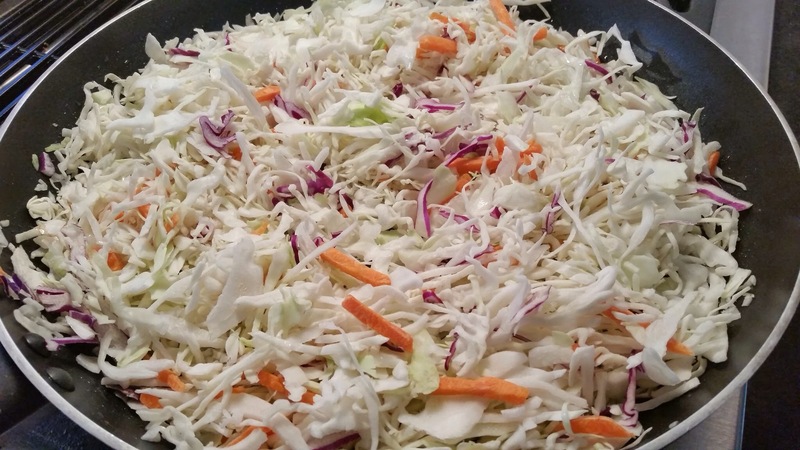 Add whatever else you’d like….bean sprouts, carrots, mushrooms, bamboo shoots. The options are endless. 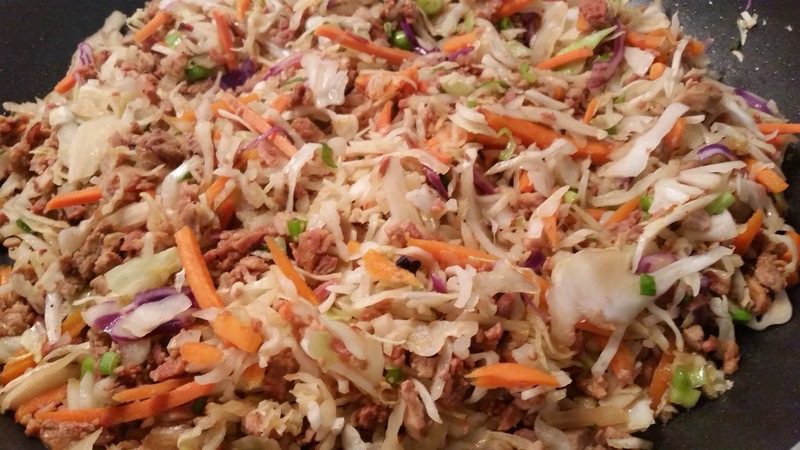 Once the cabbage and veggies begin to soften, add the diced pork, add a couple of tablespoons of soy sauce, a tablespoon of Chinese five spice and a tablespoon of ground ginger. Continue to stir until your veggies are soft. 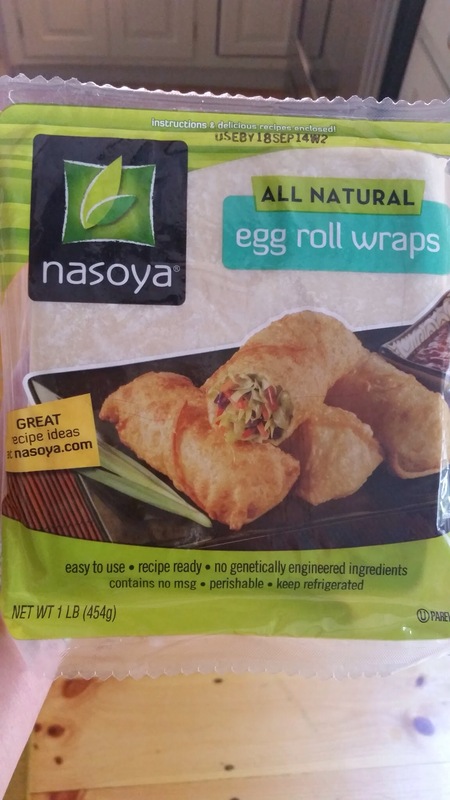 These are the egg roll wrappers I prefer. They get nice and crunchy on the outside but their soft on the inside, once fried. Get yourself a small bowl of water, unpackaged the wraps and keep them under Saran Wrap so they don’t dry out. 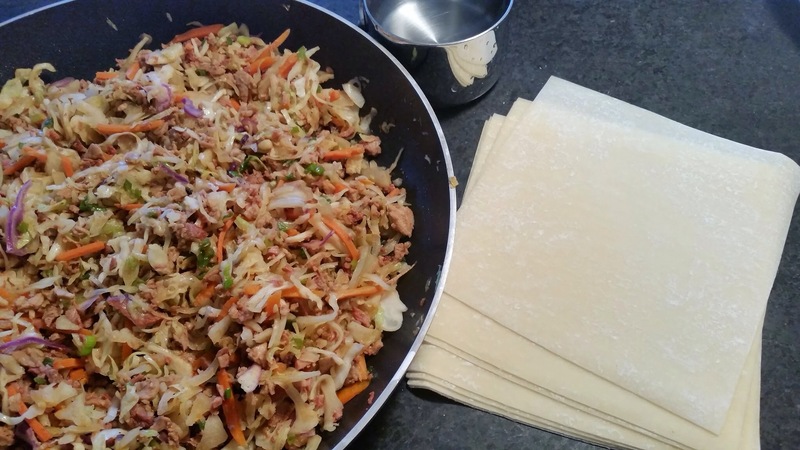 If you’ve never made egg rolls, I’d suggest a how-to video. It’s very easy but there are a few crucial mistakes to avoid. I, of course, repeatedly make said mistakes so I needed a little refresher too. Place the filling on the bottom third of the wrapper. 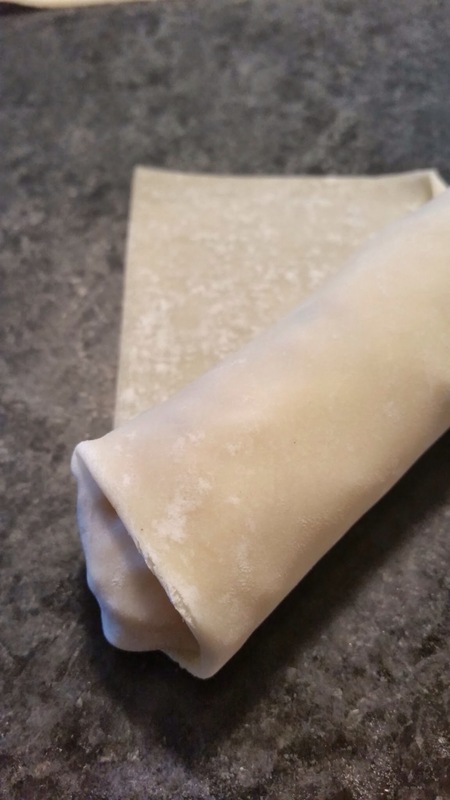 Fold the bottom corner over the filling and make sure it’s tight. 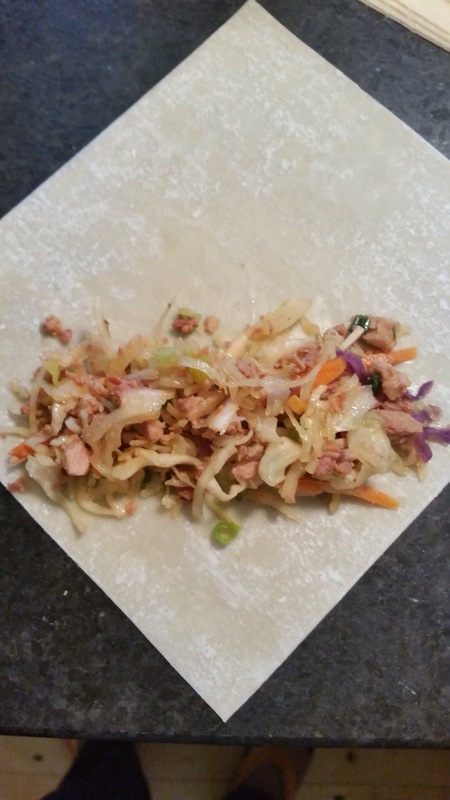 Fold the sides in and continue to roll. When you’re about to complete the roll, wet your finger in the water and trace the top corner so you get a tight seal. You also want to be sure the sides don’t have any holes, as that will allow oil in, while frying. Next, heat abut 6″ of vegetable oil in a heavy saucepan or dutchoven. Heat the oil to 350 degrees. 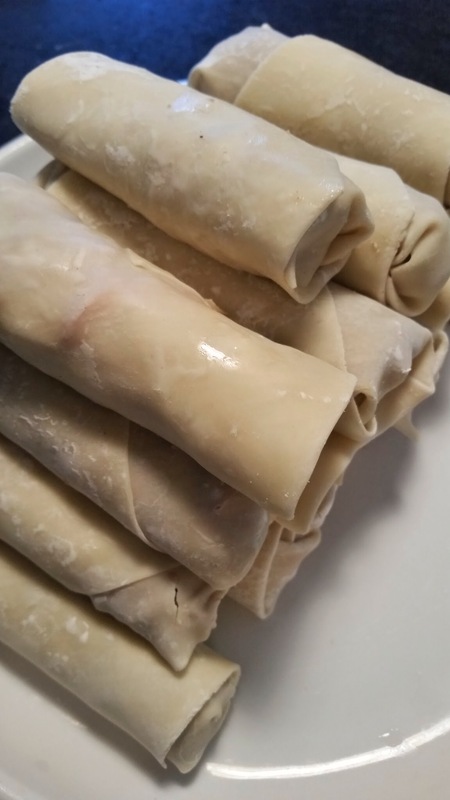 Use a slotted spoon or spatula to gently lower 3-4 egg rolls into the oil, at a time. Cook them in batches to avoid having the oil temp drop. Remove when they’re golden brown (about 3-4 minutes) and let them rest on paper towels. And there you have it! 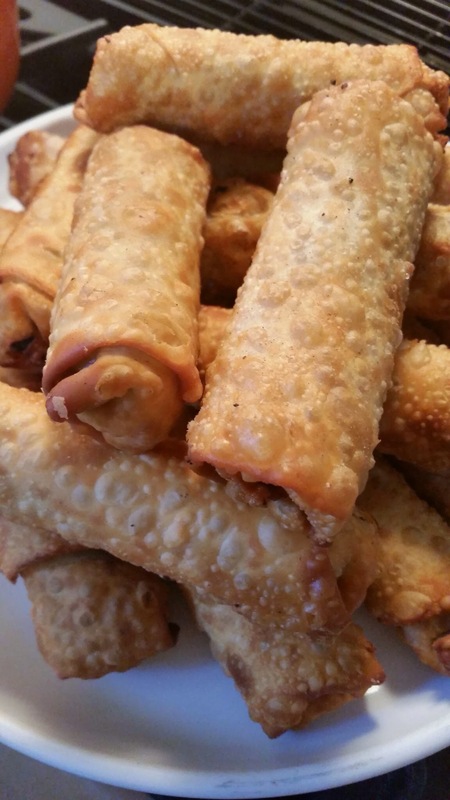 I had 18 egg rolls, when all was said and done. They can be made ahead of time and then put into a 350 degree oven for 20 minutes or so. 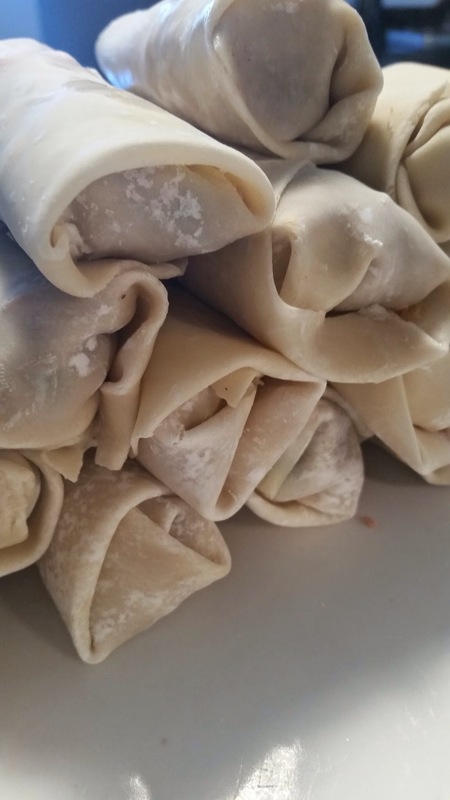 They also freeze beautifully so put some aside, before frying, wrap them in tin foil and then into a freezer zip lock bag…..and thank me later. I served them with soy sauce and for the more adventurous peeps, that enjoy a spicy, sweet and sour sauce, Nuoc Cham. Nuoc Cham is very simple to make and once you try it, you’ll want it as a dipping sauce for EVERYTHING. 1 or 2 Thai chilis or long red peppers. Remove seeds and dice. Squeeze the limes into a bowl and add the garlic. Add the rest of the ingredients and taste to be sure it’s sweet, sour and spicy. It will look cloudy but after an hour or two in the fridge, it clears up. This lasts in the fridge, in an air-tight container, for months.